Stems: Erect, 1 to several, simple or occasionally branched above, silky-hairy. Leaves: Alternate, stalked, few, odd-pinnately compound, .5 to 1.5 inch long, .5 to 1 inch wide, reduced above; leaflets 3-9, egg-shaped, to 3/4 inch long, grayish green; tips mostly blunt or terminating in minute, abrupt points. 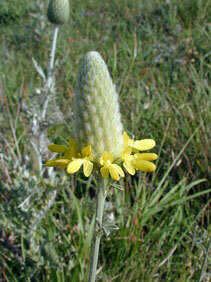 Inflorescences: Spikes, solitary, oblong or cone-like, .5 to 2.5 inches long, densely flowered, silky-hairy, terminal. Flowers: Encircling spikes and blooming from base upward; calyces 5-lobed, silky-hairy; margins feathery; corollas papilionaceous, bright yellow; stamens 10, united. Fruits: Pods, less than 1/6 inch long, silky-hairy, 1-seeded; seeds tiny, smooth, yellow. Habitat: Rocky prairie slopes, open wooded or brushy hillsides, waste areas, stream valleys, and ravines. Distribution: West 4/5 of Kansas. Forage Value: Livestock find it palatable, so it decreases with grazing. Uses: Native Americans used silktop dalea to treat diarrhea and colic. Comments: Silktop dalea's sparse foliage aids it in withstanding drought conditions.